To successfully meet customer demands for more immediate, personalized attention, companies are leveraging new technologies that go beyond traditional voice and email. By implementing such channels as live chat, social media, mobile apps, SMS/text messages, self-help solutions, and more, companies can now be ready wherever and however the customer wants. 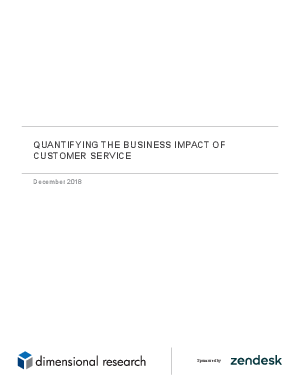 The following report, sponsored by Zendesk, is based on an online survey of 1,044 U.S. consumers who have received online or phone customer service. The research goal was to better understand present customer expectations and to quantify the impact of customer service on business results. Questions were asked about past experiences with customer service, as well as preferences and opinions. Certain questions were repeated from a similar 2013 survey to enable trend analysis.